The eating of mushrooms and other fungus can be traced back to prehistoric times. According to Alan Davidson, Author of “Food.” There are ancient lake dwellings in Germany, Austria and Switzerland where evidence of puffballs being consumed by humans has been found. Rare and expensive mushrooms like the truffle highly sought after in classical Greece and Rome. Today, there are varieties of mushrooms that are, pound for pound, some of the most expensive food money can buy. The more common types, which have been cultivated for more than 300 years, are more affordable and are a regular part of most people’s diets. 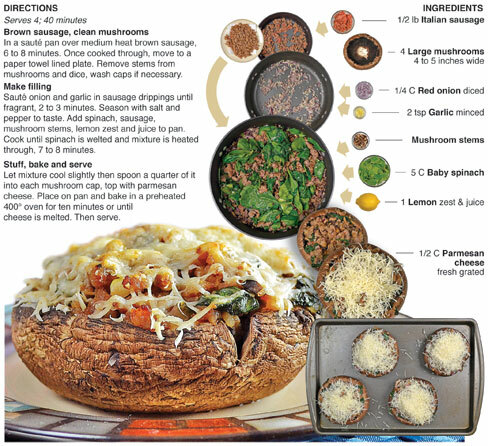 For this recipe, I use four large portabella mushrooms and stuff them with a sausage and spinach filling and top with shredded parmesan cheese. It’s a meaty bite that is surprisingly light in the belly. Lemon zest and juice is added to the mix and provides a bright balance to the earthy taste of the mushrooms. One of the great things to look forward to every spring is finding morel mushrooms. 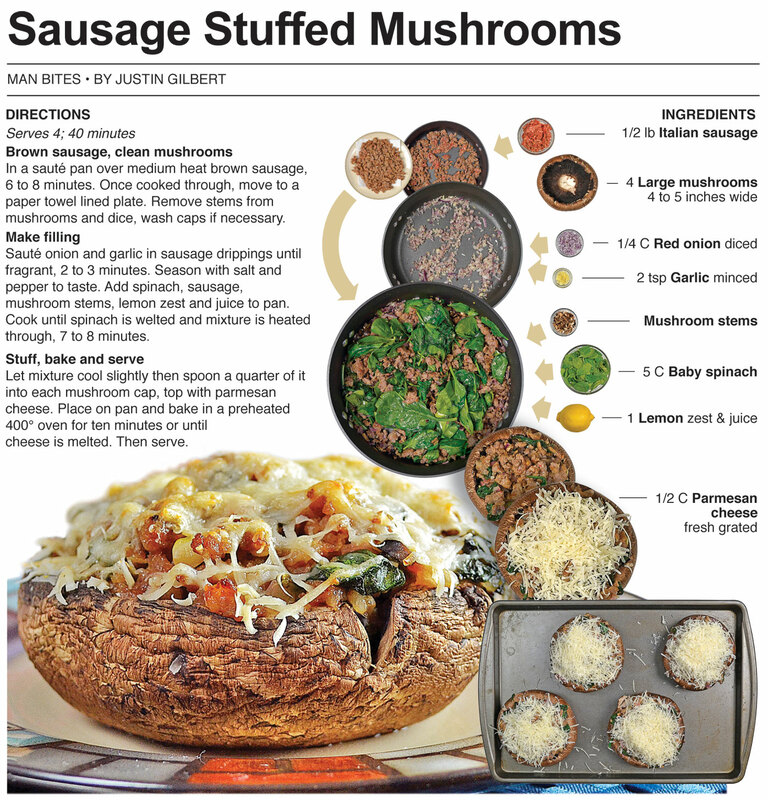 This recipe utilizes the portabella, which is tasty in its own right, but if I had my choice of mushroom it would be morels. I've had truffles and they are delicious, but finding a patch of morels in the woods and frying them with a light breading is one of the pleasures that can be found just a few strides from my front door. Growing up, there were a number of times Dad walked in the house with an armful of the delicious little wonders. Sometimes he would fry up a batch in the middle of the afternoon not being able to wait for dinner to eat them. A few years back while living in New York, I went to the grocery store and noticed a few packages of fresh morels in the produce section. My mouth started watering. Just as I was creating the menu around them in my head, I noticed the cost was $23 a pound. The price tag suddenly looked like a lump of dog doo on the package. My craving for morels disappeared in an instant. There is something about going on a mushroom hunt and bringing them in for dinner. I love to fish, but I have a hard time eating them immediately after cleaning them an hour before - just a weird quirk of mine. I need to freeze them and eat them later. With mushrooms, there’s no guts, and I can eat them the same day I harvest them. In a sauté pan over medium heat brown sausage, 6 to 8 minutes. Once cooked through, move to a paper towel lined plate. Remove stems from mushrooms and dice, wash caps if necessary. Sauté onion and garlic in sausage drippings until fragrant, 2 to 3 minutes. Season with salt and pepper to taste. Add spinach, sausage, mushroom stems, lemon zest and juice to pan. Cook until spinach is welted and mixture is heated through, 7 to 8 minutes. 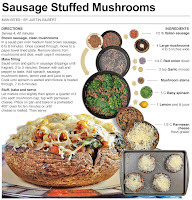 Let mixture cool slightly then spoon a quarter of it into each mushroom cap, top with parmesan cheese. 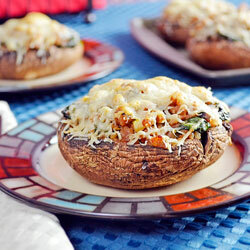 Place on pan and bake in a preheated 400° oven for ten minutes or until cheese is melted. Then serve.